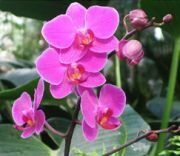 “I bet the Garden of Eden looked just like this,” Elizabeth said, her eyes shining as she inspected a brilliant fuschia orchid. She had expected Pemberley’s garden to be beautiful, but she hadn’t anticipated this lush tropical wilderness. “Then I’d better find some other spots to kiss.” He bent down and nuzzled her neck and ear until she shrieked and tried to wriggle away. His mouth swooped down to cover hers in a long, deep kiss that stifled her laughter. She curled her hand into his and they continued down the path, his unabashed pleasure in sharing his home tugging at her heart. Rarely had she seen him so relaxed and—she paused for a moment to summon the right word—peaceful? Fulfilled? They wandered along, pausing occasionally to inspect an exotic bloom or to examine a tiny lizard skittering across the sun-dappled path. A canopy of trees wrapped the garden in seclusion, the silence punctuated by the twittering of birds and the occasional forlorn cry of a gull wheeling overhead. Through a clearing in the trees she could see the ocean, an expanse of glittering sapphire stretching to the horizon. They sat on a worn bench beneath the roof, still holding hands. “I can see why you love it here,” she breathed. It seemed important to speak in hushed tones, as though they had stumbled onto a serene, leafy chapel. The catch in his voice made her ache for him. She released his hand and began to rub his back gently. “Georgie was just a baby when your mother died, wasn’t she?” He had occasionally spoken of his mother, but Elizabeth knew little about the circumstances of Anna Darcy’s death. “She was about two months old.” He closed his eyes, relaxing under her ministrations. “No.” His jaw tightened, and she felt the tension in his back muscles. “They were lovers?” she asked gently, still stroking his back. “I’m surprised he moved out of the townhouse,” she remarked. It mystified her that Edmund, whose birthright included the house, had been the one to leave instead of Anna. “That’s how much he wanted to get away from us. And I suppose it gave him more latitude to live as he chose. He had more than his share of affairs over the years. Discreetly, of course, but the gossip mill always found out.” He leaned forward again, staring at the ground. A filament of sunlight touched the ground outside the gazebo. The brief shower had passed, though raindrops still dripped from the trees. The moisture-laden air carried the heady perfume of damp earth, green leaves, and spicy tropical blooms. “Did your grandmother know about … the man?” She didn’t know what else to call him, since William hadn’t mentioned his name. His tone discouraged further queries about Edmund, which was maddening. Elizabeth opened her mouth to ask a critical question despite William’s aloofness, but she bit back the words when the indelicacy of her intended probe struck her full force. He had shown unprecedented trust by sharing painful details of his childhood. Although he had chosen to omit a key puzzle piece, she would not press him beyond his comfort zone. At least, not yet. A fresh breeze swirled through the garden, dislodging a blizzard of fragile pink petals from a nearby tree and floating them into the gazebo. She brushed them from his hair, and he returned the favor with his usual courtly grace. “I’d have expected, when your parents separated, that your father would have been the one to stay; after all, it’s his family’s house. And then later if your grandmother found out about your mother’s affair …” It wasn’t the question she wanted to ask, but she hoped it might elicit further confidences. “It was that serious? I had no idea.” She tightened her grip on his hands. “She sounds a lot like her grandson.” Elizabeth smiled up at him. She nodded and rose to her feet, her mind whirling from the impact of his story. The timeline of the last two years of Anna Darcy’s life led her to an inevitable and troubling conclusion. She wished William would tell her the rest, and again she fought the temptation to give voice to her suspicions. They found Mrs. Shepherd dusting in one of the upstairs bedrooms. William had taken Elizabeth on a lengthy tour of the house after brunch, and this room had been her favorite, decorated in white with touches of shell pink and pale aqua. At William’s request for a snack suitable for a beach picnic, the housekeeper smiled. “I know just the thing,” she said genially. “Won’t take me but two shakes.” She set down her dust cloth and made her ponderous way down the hall toward the stairs. William drew Elizabeth into his bedroom. “Why does she have to be so efficient?” he grumbled. “Two shakes isn’t much time. If she’d said half an hour …” He lifted an eyebrow, his grin rakish as he ran his hands down her bare arms in a sinuous motion. Goose bumps rose up on her arms. “You, sir, are insatiable.” She almost snickered at her involuntary thought: Pot, kettle. “In a tank top and shorts?” Her protest sounded weak but she wasn’t sure where she found the will to argue with him at all while his body surrounded hers with insistent heat and his lips flitted across her cheek. Elizabeth flinched and yanked her hands from William’s bare chest, easily accessible through his half-unbuttoned shirt, as though the touch of his skin burned her palms. Her face aflame, she tugged down the hem of her tank top and crossed her arms over her chest. Elizabeth ground her teeth until Mrs. Shepherd was out of earshot. “How do you do that?” she spat out in a taut whisper. “Take it in stride when we’re practically caught in flagrante delicto?” She had expected a strong reaction from him—either anger at the interruption, or embarrassment similar to her own. “Definitely the beach.” Elizabeth extricated herself from his embrace, her amorous mood drowned in a sea of humiliation. She doubted she’d ever be able to make love to William again with Mrs. Shepherd, or anyone else, within a mile of the house. The sight of the empty table in the front hallway filled her with dismay. Based on their earlier path through the house, she had probably left her sunglasses in the kitchen. Her mind raced to find an alternative to facing Mrs. Shepherd again so soon. Finding none, she adjusted her ponytail, lifted her head high, and strode into the kitchen assuming a counterfeit air of breezy confidence. Elizabeth resisted the urge to dive under the table. Mrs. Shepherd must have noticed her distress, because she wiped her hands on a towel and patted Elizabeth’s arm. “I’m sorry, Ms. Elizabeth, I didn’t mean to embarrass you. Of course you want to make the most of having a handsome man like Mr. Darcy around.” She shook her head. “But there I go again. It’s like Winston always says. Every thought that pops into my head falls right out of my mouth.” Winston, the laconic Mr. Shepherd, had responded to Elizabeth’s friendly remarks in polite monosyllables yesterday morning while driving her back to the hotel. Even without the overt emphasis on those last two words, Elizabeth would have guessed from the mischievous glint in Mrs. Shepherd’s eye that this was merely a pretext. “I’m sure he wouldn’t mind.” Elizabeth’s mind raced ahead, devising enticing plans for an evening of complete privacy. No, William wouldn’t mind at all. As usual, peace reigned on the beach below Pemberley. A small flock of surfers bobbed in the waves, and an occasional beachcomber strolled past near the tide line, but aside from those minor distractions William and Elizabeth had the long stretch of powdery cream-colored sand to themselves. The solitude and the untamed natural beauty of the spot never failed to soothe William’s soul, but today he found an even deeper peace. They had spread their blanket near the cliff, taking advantage of the gathering shade as the sun, it heat still merciless despite the waning of the afternoon, shifted behind them. Elizabeth leaned back against William’s body, her head resting on his shoulder, his arms encircling her waist from behind. They had said little since finishing their impromptu snack, but it was a comfortable silence. He was content to gaze at the turbulent ocean while he savored the silent communion flowing between them. She raised her wine glass, swallowing the final sip. “More wine?” he asked, struggling to reach for the bottle but hampered by Elizabeth’s recumbent position against him. “I’d better not.” He felt pleasantly lethargic; more wine might send him into a stupor. He kissed the top of her head. Sometimes, with his weight of family responsibility and the demands of his career, he lost sight of the freedom of choice his wealth granted him. It was a freedom Elizabeth had never known, one that would require adjustment after her years of fierce self-reliance. William winced and his eyes dropped to the blanket. He ran a finger along the diamond pattern in the weave, trying to distract himself from feeling like an insensitive jackass. Curiosity trumped his self-recriminations and his eyes flew to her face, but he waited in silence for an explanation. “You’re completely forgiven.” He bent his head for a kiss. It wasn’t quite the truth. He hated knowing that she hadn’t loved and trusted him enough to forgive him sooner. But he supposed it was the same for her. His transgressions had probably inflicted wounds too deep to vanish overnight. At least now they could heal together. “Did they play Pebble Beach?” The famous golf course overlooked the ocean about an hour south of San Francisco, not far from the charming seaside town of Carmel. He limited his response to a small, non-committal grunt. Lydia’s presence would have taken the day from “unpleasant” to “excruciating” on the pain chart. “No, it’ll taste much better here.” He tightened his arms around her. He grabbed her and tumbled her back onto the blanket. “I love you,” he murmured, leaning over her. William was happy to oblige. The citronella candles didn’t completely ward off the insects darting about the garden, but dinner in the gazebo was a success all the same. William’s thoughts echoed Elizabeth’s earlier remark about the Garden of Eden. Despite their closeness to the house, the exotic foliage surrounding the gazebo wrapped them in cozy seclusion, and Barbados’s whistling tree frogs provided music fitting to the atmosphere. When Mrs. Shepherd came out to clear their dinner dishes and deliver two helpings of piña colada cheesecake, she announced her departure for the night. William bid her an enthusiastic farewell, wondering how the kindly woman had managed to read his mind. Elizabeth popped a bite of cheesecake into her mouth, a blissful expression on her face. She glowed in the candlelight, auburn highlights glimmering in her hair as it floated around her bare shoulders, ruffled gently by the balmy night air. “I don’t even want to think about how many calories I just consumed,” she declared, setting her fork on her empty dessert plate. “Then you’ll find something in September.” And in the meantime she could travel with him. He bit back the suggestion; she would bristle at the idea of relying on him for support. “But now things are different.” He speared the last bite of cheesecake on his fork. He opened his mouth to rebuff her ghastly suggestion. But then it dawned on him that his own actions, in interfering in her career, had reduced her to this fate. “You really think it’ll come to that?” he asked, as gently as he could. “Of course.” He pushed back his chair and rose, intending to help her to her feet, but she was already standing, smoothing her dress. Her arms went around his neck, her fingers stroking the nape. The light touch traveled to every nerve ending in his body. He felt the gentle pressure of her hands against his neck and responded immediately, dipping his head to kiss her. “Mmm, you taste good,” he murmured against her mouth, wrapping her in his arms. “What would you like to do this evening?” she asked when at last he dragged his mouth away from hers. “You were thinking of birthday suits instead?” She might have blushed, but in the near-darkness he couldn’t be sure. “Precisely.” He tipped his head and gave her a crooked grin he hoped was seductive. “Excellent. Let’s go.” He took her hand and strode down the path leading out of the garden.